Superman falls from the sky as Gallo communes with the Green K. His secretary interrupts him with a call. Superman, in the meanwhile, is viciously pummeled by Luthor goons when he lands. He is near death when Gallo finally closes the door and cuts off the giant rock from harming Superman from afar. Luthor, observing this from afar but unconnected to the affair (obviously), is curious. Jimmy grabs a beaten Superman after Superman fights his way back through the baddies to the surface. Superman is bruised, beaten, and near unconsciousness. 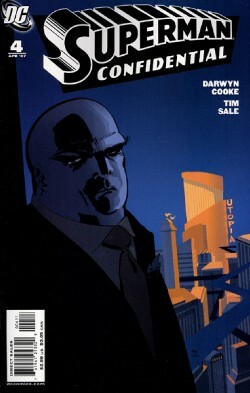 Lois seeks Gallo's Achilles' Heel, and finds Luthor in a back alley. He beckons her into his vehicle and shows her Superman's weakness, which he insists he aims to exploit. Jimmy commandeers a vehicle and heads back to Kent's apartment on Superman's request, only to find Clark Kent waiting for them as Superman collapses inside. Story - 5: This book, pound for pound, continues to give the very same experience and feel as the incredibly awesome For All Seasons, and serves as a very worthy successor. The side character of Gallo isn't overshadowing the main characters, and though the story is a bit formulaic, it is also a very classic telling of a story that is relatively untold. As I've said a number of times to people who insist that I just shut up and enjoy the stories and not worry about the continuity, that's possible, you just have to have a story like this. Yes, there was a difference between this and Byrne, yes, there's a cell phone here and it indicates that Superman would have just started out in the post cell world, yes, it's got issues with Lois and Superman dating and takes liberties, per For All Seasons, but the story is so great you just ride along with it. I almost wish I had a dig here, because lately I've been handing out a lot of gushing fives. It does to show that the stories, when they come out, have been pretty magnificent of late, and I love that. Art - 5: I always wanted to do a review where, under a category, I just listed the name as the review. "TIM. SALE." That's not fair to you guys, because a review needs more than that, but it's hard, in this case, not to just say Tim Sale. I had a booth at Wizard World LA, and the line from Tim's booth, sixty feet away, stretched all the way to my booth, where punkish fans sat their crap on my table and waited for two minutes with the man. I don't like their rudeness. But I understand why they waited. Cover Art - 4: I wanted a bit more in the sky, and the colors were just a BIT too plain in this case, but you can't beat a malevolent Luthor, in print, picture, or coming after you. This Luthor could kill me and I would grin.